After hundreds of years of observation, theorizing, exploration, and data collection, the universe is still a mysterious place. Numerous cosmic questions remain unanswered despite the scientific and technological advances made since the telescope was invented in the 1600s. But we are learning more about the cosmos all the time through intense examination of the solar system in which we live. Still, learning about the outer solar system has proved to be difficult, to say the least. 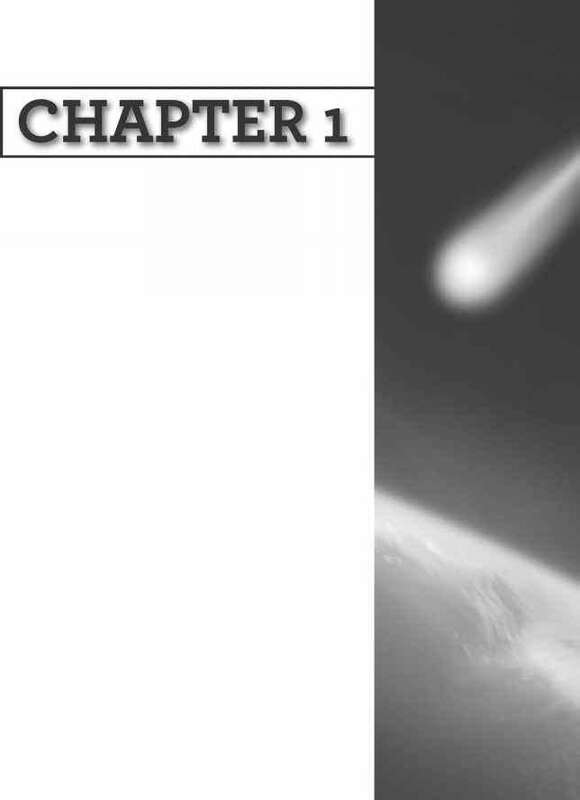 What is known about the farthest reaches of our solar system is discussed, at great length and in fine detail, in this book. Scientists have launched many spacecraft into orbit. Manned spacecraft have traveled as far as the moon. Unmanned probes have approached most of the planets and even landed on Mars. These probes tell scientists more about the solar system than we could ever learn with telescopes alone. In 1977, the Voyager 1 probe was sent into space for the purpose of exploring Jupiter and Saturn. Other probes were sent in the years that followed. It took decades for these probes to reach the most distant planets and send back data about them. Presently, Voyager 1 is the farthest man-made object from Earth; it is approaching the edge of the known solar system, and scientists hope it will gain new information about the mystifying region known as the Kuiper Belt. The Voyager and other missions represent the limit of our physical reach within the cosmos. For now, we depend on the data they have collected to gain a better understanding of the outer solar system. Beyond the orbit of Mars—which represents the planetary boundary between the inner and outer solar system—is a ring of asteroids orbiting the Sun. The asteroid belt contains rocky objects left over from the formation of the solar system. The asteroids range in size from hundreds of kilometers in diameter to dust-sized particles. The largest asteroid in the asteroid belt, Ceres, is considered a dwarf planet. 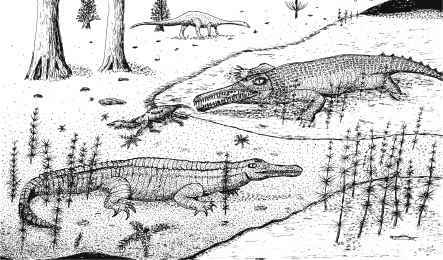 It was the first asteroid ever discovered. By 2009, more than 450,000 asteroids had been discovered. While most asteroids orbit the sun in the main belt between Mars and Jupiter, some stray closer to Earth. These are called near-Earth asteroids (NEAs). Most NEAs are still far from Earth, but some actually cross Earth's orbit, making them potentially deadly to life on Earth. As they tumble into Earth's orbit, stony or metallic chunks of space matter known as meteors burst into friction-induced flame, creating a fiery show in the night sky. NASA/Getty Images other objects, or those that have the potential to do so. If a meteoroid comes close enough to Earth, it might enter our atmosphere. The swiftly moving meteoroid becomes so hot that it glows, creating a visible phenomenon we call a meteor or shooting star. A meteor that reaches the ground before burning up is called a meteorite. Large meteorites can create deep impressions in the ground called impact craters, like those we can see on the moon's surface. The first of the outer planets is the fifth planet from the Sun—Jupiter. It is the most massive planet in the solar system and is larger than all the other planets combined. This "gas giant" has a diameter of about 143,000 km (88,900 miles). Jupiter's mean orbital distance is 778 million km (483 million miles), and it takes about 12 years to make one rotation around the sun. We can see Jupiter's atmosphere from Earth with a telescope. It is well known for its bands of colour. Close-up views of Jupiter have shown quickly moving clouds and giant, cyclonelike storms. The Great Red Spot—a cyclone larger than Earth and Mars together—is perhaps Jupiter's most notable feature. The clouds around Jupiter contain numerous substances, particularly pure hydrogen and helium, methane, ammonia, and water. Jupiter doesn't have a solid surface. Since scientists cannot see past its atmosphere, they have come up with theories about what lies below it. Jupiter has a significant magnetic field and constantly radiates radio waves. The planet also creates more energy than it receives from the Sun—another fact that continues to intrigue scientists. To date, more than 60 moons have been discovered in orbit around Jupiter, and there are likely more. The largest moon in the solar system—Ganymede—is larger than Mercury! Several of these worlds are as interesting to scientists as the planet they circle. Jupiter also has a ring of ice and dust similar to but much smaller than those around Saturn. You probably recognize Saturn as the ringed planet. It is the second-largest planet in the solar system with a diameter of 120,536 km (74,898 miles). At a mean orbital distance of 1,427,000,000 km (887 million miles), it takes Saturn nearly 30 years to make one trip around the Sun. Saturn's atmosphere is similar to Jupiter's, but it is much less active. Like Jupiter, Saturn does not have a solid surface. It is surrounded by a dense, complex layer of clouds that appear as light-brown bands circling the planet. Storms are sometimes visible as well. Saturn has the most hydrogen-rich atmosphere of all the planets with 91 percent hydrogen and 6 percent helium. Common compounds include ammonia and methane, among smaller traces of others. Scientists think Saturn's interior is made up mainly of liquid hydrogen. The core is probably a liquid, metallic substance. Saturn's magnetic field is probably due to motions in its metallic core. The entire ring system is nearly one million km (600,000 miles) wide, but only about 100 metres (330 feet) thick. The total mass of the rings is about the same as the mass of Saturn's moon Mimas. Titan, Saturn's largest moon, is the second largest moon in the solar system, second to Jupiter's Ganymede. Saturn's moons and rings are closely related. 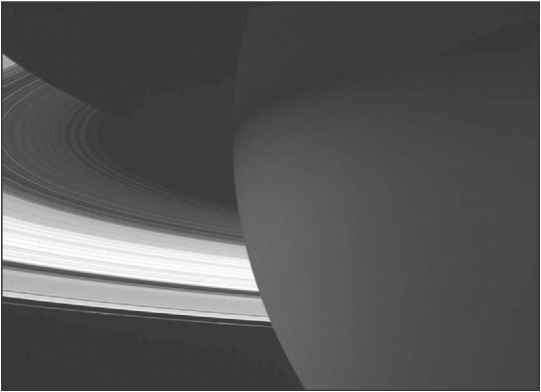 In fact, Saturn's two smallest moons are within the ring structure itself. Each of the particles that make up the rings—which range from dust-sized to house-sized—could be considered satellites orbiting the planet. This may make it impossible to ever know how many moons Saturn truly has. Uranus is the seventh planet from the Sun and the least massive of the outer planets. Its mean distance from the Sun is nearly 2.9 billion km (1.8 billion miles). At this distance, it takes the planet more than 84 years to orbit the Sun. It has an equatorial diameter of 51,118 km (31,764 miles). The atmosphere of Uranus is made primarily of hydrogen and helium, but also contains oxygen, nitrogen, sulfur, and carbon. The most common compounds include methane, ammonia, and water. The visible surface of Uranus is blue with no "spots" like those seen on Jupiter and Saturn. This shows that of all the outer planets, Uranus has the lowest amount of storms. Images taken by Voyager 2, however, revealed faint cloud bands on the blue planet. Scientists believe that, beneath its gaseous outer layer, Uranus is a fluid planet. It radiates the least amount of internal heat of the outer planets. Unlike the other planets, Uranus's axis is nearly parallel with its orbital path, which means that it spins on its side. This may have resulted long ago when a moon-sized body collided with Uranus. The planet's north pole faces the Sun for about 42 years, and then the south pole faces the Sun for an equal period. Like Jupiter, Uranus has thin rings of dust and ice, and currently has 27 known moons. At approximately 4,498,250,000 km (2,795,083,000 miles), Neptune is the farthest planet from the Sun, and the only one that cannot be seen with the unaided eye. It takes Neptune more than 163 years to orbit the sun. Neptune is the third-most massive planet, but the smallest of the outer planets with an equatorial diameter of 49,528 km (30,775 miles). That is about four times the size of Earth. Like the other outer planets, Neptune's atmosphere is made up mainly of hydrogen and helium. The planet's blue colour is due to the presence of methane in its atmosphere, which absorbs red light and reflects blue light. 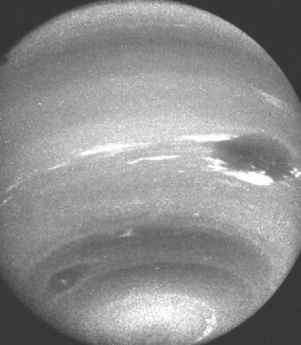 Dark, stormy spots and white clouds are sometimes visible on Neptune's surface. Since Neptune's density is greater than the other outer planets, scientists believe it has a greater percentage of melted ices and molten, rocky materials than the other gas giants. Although Neptune receives less than half the amount of sunlight as Uranus, the temperatures of both planets are very similar. This is because Neptune emits more than twice the energy it receives from the Sun. Scientists are not sure what causes this. Neptune's inner heat creates powerful storms on its surface and the fastest winds in the solar system. planet. Many of the particles that make up Neptune's rings are dust-sized. Discovered in 1930, Pluto was once known as the ninth and smallest planet of the solar system. However, in 2006 its status was lowered to dwarf planet. With a diameter of 2,344 km (1,456 miles), it is only about two-thirds the size of Earth's Moon. It is interesting to note, however, that Pluto has three of its own moons-Charon, Nix, and Hydra. The latter two are very small, but Charon is similar in size to Pluto, and many scientists consider them "twin planets." Pluto's mean orbital distance from the sun is 5.9 billion km (3.7 billion miles). Its orbit is more elongated than any of the planets. In fact, it is actually closer to the Sun than Neptune for part of its trip around the Sun. Pluto is so far away from the Sun that it takes sunlight more than 5 hours to reach it, and it receives about 1/1,600 of the amount of sunlight that reaches Earth. This makes Pluto a very cold place. Although the dwarf planet has a thin atmosphere, most gases-espe-cially methane and carbon dioxide—freeze at such low temperatures. These substances and other ices form a reflective layer on Pluto's surface. Like many of the icy moons of Jupiter and Saturn, Pluto probably has a rocky core surrounded by a layer of ice. Pluto resides in the solar system's most distant orbital region called the Kuiper Belt. Kuiper Belt objects (KBOs) are made of ice and rock left over from the formation of the solar system. Other dwarf planets, most of which were recently discovered, also orbit the Sun within this region beyond Neptune. Pluto isn't even the largest KBO. Eris is an icy dwarf planet with a diameter of 2,500 km (1,550 miles), making it slightly larger than Pluto. It orbits the Sun once every 560 years and has one known moon. Other notable KBO dwarf moons include Makemake with a diameter of about 1,500 km (900 miles), and Haumea, an egg-shaped object with two tiny moons. Of all the bodies that orbit the Sun, comets are those that travel to the farthest reaches of the solar system. Comets have very eccentric orbits, which means that they are oval-shaped. This brings them very close to the Sun at times; other times they are very far away. Comets are sorted into two categories based on how long their periods, or orbits, last. Short-period comets have orbits of less than 200 years. Long-period comets have orbits longer than 200 years. You may picture a comet as a fiery ball with a long tail. However, the only permanent characteristic of a comet is a rocky, icy center called the nucleus. A nucleus can remain unchanged in the deepest parts of the solar system for thousands of years. As the comet approaches the Sun it grows warmer. The evaporating gases and dust form an "atmosphere" around the comet called the coma. Still closer to the Sun, solar radiation blows dust away from the coma, producing a tail. Solar wind blows ionized gas away from the coma in a slightly different direction. All comets disappear eventually, and in relatively short time on a cosmic scale. Some are thrown out of the solar system due to the gravitational pulls of the larger planets. Others decay in solar heat. You might wonder if comets would someday disappear from the solar system altogether. Scientists have discovered that comets are "born" in the farthest reaches of the solar system, in a region called the Oort cloud. The Oort cloud is a large area of gas and dust left over from the formation of the solar system. Much like the planets themselves, the Ort cloud orbits the Sun. Although scientists are still trying to understand the origins and features of this mysterious region, most believe it is the source of our solar system's comets. The solar system exists in an area scientists call the heliosphere. Beyond the heliosphere is a transition region called the heliosheath. This is where the Sun's solar wind is slowed by forces outside the solar system. Voyagers 1 and 2 have reached this area. Beyond the heliosheath is the heliopause, which marks the outer boundary of the solar system between 17 and 26 billion km (10 and 16 billion miles) from the Sun. What will we learn about this distant boundary when the Voyager probes reach it? We can only wait and see. scorched Mercury, enshrouded Venus, and frigid Mars—lie the rocky bodies of the asteroid belt. Any natural solar system object other than the Sun, a planet, a dwarf planet, or a moon is called a small body; these include asteroids, meteoroids, and comets. Beyond those remnants of the early solar system lie the planets of the outer solar system. These planets, in order of their distance outward from the Sun, are Jupiter, Saturn, Uranus, and Neptune. Many astronomers consider the asteroid belt a demarcation point between the inner solar system (consisting mainly of the terrestrial planets) and the outer solar system. Most of the rocky asteroids move around the Sun in elliptical orbits in the same direction of the Sun's rotation. Such motion is termed prograde. Looking down on the solar system from a vantage point above Earth's North Pole, an observer would find that prograde orbits are counterclockwise. Orbits in a clockwise direction are called retrograde. By comparison with those of the inner solar system, the planets of the outer solar system are veritable giants. Shown to scale, outward from the Sun, are Mercury, Venus, Earth, Mars, Jupiter, Saturn, Uranus, and Neptune. Also shown is the dwarf planet, Pluto. NASA/Lunar and Planetary Laboratory recognized by the general public. Among scientists, those who study individual objects with dynamically interesting orbits or groups of objects with similar orbital characteristics generally use the term minor planet, whereas those who study the physical properties of such objects usually refer to them as asteroids.